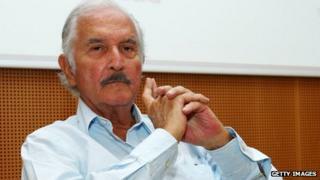 The Mexican author Carlos Fuentes has died, aged 83. Fuentes was one of the most prolific Latin American writers known equally for his fiction and his essays on politics and culture. His most famous works were The Death of Artemio Cruz and The Old Gringo. He was associated with the Latin American Boom - a literary movement made up of mainly young authors whose politically critical works broke with established traditions. He died in a hospital in Mexico City. Hospital sources did not comment on his cause of death. Mr Fuentes wrote a wealth of novels, plays and essays and regularly commented on political events in Spanish newspaper El Pais. Born in Panama in 1928, he did not move to Mexico until he was 16. The son of a diplomat, Mr Fuentes spent much of his childhood moving around the Western Hemisphere. He said it was this which allowed him to view Latin America from a distance, giving him a critical edge. In many of his works he drew on historical events. His narrative, like that of his contemporaries of the Latin American Boom, was rarely linear, instead relying on flashbacks and changing perspectives. Among English-language readers he is arguably best known for his novel The Old Gringo, which was made into a film starring Gregory Peck in 1989. The novel was inspired by the real-life disappearance of American journalist Ambrose Bierce during the 1910-1920 Mexican Revolution. He was also outspoken in his political views, and was a vocal critic of US administrations, including Washington's policies on immigration and the war on terror. Fuentes was also highly critical of Mexican politics, and in a recent interview with the BBC World Service, he called for a different approach to the war on drugs. He also described the three main candidates in the Mexican presidential election as "mediocre". Cultural and political figures around the world expressed their grief at the news of his death. "I am profoundly sorry for the death of our loved and admired Carlos Fuentes, writer and universal Mexican. Rest in peace," Mexican President Felipe Calderon wrote on Twitter. The front-runner in July's election, Enrique Pena Nieto, said he had not always agreed with Fuentes on political matters but that he recognised his "extraordinary work". Nobel Prize-winning Peruvian author Mario Vargas Llosa told Spanish daily newspaper El Pais that "with him, we lose a writer whose work and whose presence left a deep imprint". Mexican novelist Jose Agustin told BBC Mundo that Carlos Fuentes "became an essential protagonist in Mexican political and cultural life. He had an immense value, from his first launch in the 1950s he never once backed down for anybody". Chilean-American writer Ariel Dorfman said Fuentes had an amazing generosity of spirit. "He was constantly, constantly championing the younger people. I never heard him say anything nasty about anybody," Dorfman told the BBC. Mr Fuentes had often been mentioned as a candidate for the Nobel Prize but never won. Among the many major literary awards he did win was the Cervantes Prize in 1987. He continued to write until the end, with an essay on the recent change of power in France published in Mexican newspaper Reforma on Tuesday, the same day the Angeles del Pedregal hospital announced his death.